7 nights' full board accommodation. Our independent walking holiday explores a remarkably beautiful area of the northern Provence known as Les Baronnies. Les Baronnies is a secret and unspoilt corner of France where the Alps meet the Provence with beautiful historic villages clinging to rocky mountain sides decorated in purple lavender flowers. Sheltered by the mountains, its privileged position and distinct climate gives the region a remarkable light that draws you into the rugged and beautiful landscapes laid out before you. But it's not just your sight that will be bombarded on this unique self-guided walking holiday, it is also a region where wild Thyme, Lavender, herbs and pine produce a wonderfully scented landscape. Each corner of this fascinating area has its own characteristics. Rocky bluffs and cliffs define summit tops from which steep slopes marked by ravines descend into narrow gorges or wide fertile valleys covered in Lavender, fruit trees and olive groves. Oak forests, scrub and moorland add to the tapestry of vegetation covering the hills. The historic legacy of the region is rich and is said to go back to Hannibal, the Carthaginian leader who crossed les Baronnies with his elephants around 200BC. There are a large number of well-preserved fortified medieval villages clinging to steep hillsides established by the barons of Mévouillon and Montauban in the 11th century. Their towers, walls and alleyways are now altered by a succession of historic events that have marked the region. One of the prettiest and most spectacular is Montbrun-les-Bains which is built on 6 levels. The double influence of the Alps and the Mediterranean has created an exceptionally rich fauna and flora including orchids such as the Sabot de Venus, vultures, chamois, wolves and wild boar. It is therefore not surprising that this secret and untamed area has recently been designated a Natural Regional Park - Baronnies Regional Park. The walking on this self-guided holiday is graded as moderate or moderate to challenging depending on your choices. The moderately graded holiday has average distances of about 14km with about 350m of ascent. There is one rest day and one longer day at 20km with 760m of ascent. The more challenging grade includes the options of ascending two summits on two of the days and doing a walk on the rest day. Due to the nature of the landscape some small sections can be relatively steep. Paths are generally good and well defined, although they can be rough in places. The steep terrain means that it would be unwise to do this holiday if you suffered from vertigo. Travel to northern Provence and welcome at your beautiful guest house with swimming pool near the village of Montbrun les Bains. Today your walking trail takes you onto pasture, lavender fields and moorland on the slopes of the Montagne du Buc. At the Col des Aries, there is the option of going to its summit for exceptional panoramic views of the surrounding countryside. Otherwise, the route descends through forest and scrub to reach the upper end of a beautiful valley, with views towards Montbrun les Bains and beyond to Mont Ventoux. Your guest house is situated at Barret de Lioure which sits on a promontory overlooking this valley. Moderate: 14km, +360m. Mod/chall: 20km, +770m. An easier days walking. You'll cross undulating countryside which alternates between lavender fields and forest and passes through the tiny hamlet of St Trinit with its historic buildings. Reach the historic village of Sault with its promenade overlooking the Nesque Valley. 12km, +120m. Departure after breakfast and transfer by bus to Carpentras for onward travel. Once you have booked on this independent walking or trekking holiday, further information about the walking, the region and what to bring, will be sent to you. We do have a web page dedicated to what clothes and equipment you should bring. In addition, our travel shop has direct access to all the top walking and travel retailers. Please contact us if you need any further information. On our independent walking holiday in the Baronnies, you will stay in a number of charming bed & breakfasts full of local character (3 corns quality) and a 2 star hotel in Sault. All rooms have private bathrooms. Examples of the guest houses used on the holiday are shown below. They are small, very comfortable guest houses which range from renovated farms to old chateaux where you'll be treated to a warm welcome. The style and comfort varies from chic to rustic, but each has their own charm and your hosts will enjoy giving up their time to make your stay extra special. A hearty and healthy continental breakfast provides the perfect opportunity to discover the local specialities such as home-made jams and local yoghurt. At midday you will eat packed lunches prepared by your hosts. All evening meals will be taken at your guest houses, where you will be treated to delicious local delicacies and great wine. TGV trains run from Paris and Lyon to Avignon. At Avignon, take the bus on line 5.1 to Carpentras, which takes about 50mins. Alternatively you can take a local regional train service from Avignon centre to Carpentras. We will book a local on-demand bus service on your behalf to take you from Carpentras to Montbrun les Bains and your guest house. Return journey by the same method. The closest airport is Avignon. There are regular flights from a number of UK airports as well as French airports. Flybe has services from Exeter, Southampton, Birmingham, Manchester and Leeds. There are a number of car hire firms at the airport including Avis, Europcar and Hertz. We would be happy to book travel arrangements to France on your behalf for this guided walking holiday. Channel ferry crossings from Dover are provided by a number of operators including P&O Ferries, Eurotunnel and DFDS Seaways. 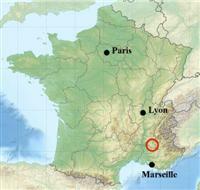 Once in France, the journey from Calais to the Baronnies takes about 10 hours (excluding long breaks). Tolls amount to about 50 euros each way. Non secured parking is available at the guest houses. Please inform us of this at the time of booking so when can provide you with directions to the first guest house.